Laverne & Shirley rode the rails… to murder! Between cost-cutting measures and attempts to prevent both terrorism and lung cancer, the experience of taking a flight has changed dramatically over the years. Not just the fact that you used to be able to smoke—which has become a staple gag of period pieces and/or time-travel comedies—but the fact that flying used to be such a big deal that passengers would actually dress up to take flights. Cited far less often, however, is that it also used to be a pretty big deal to take a trip by train. But that’s evident from the opening moments of “Murder On The Moosejaw Express,” an epic two-parter that aired during the last quarter of Laverne & Shirley’s fifth season. When Laverne and Shirley board the Moosejaw Express and enter their compartment on the sleeper car, they’re giddy with excitement about its size, with Shirley additionally pointing out how incredibly clean everything is. In doing so, she sets up the arrival of their fellow travelers: As soon as Laverne agrees and says, “I’ll bet this compartment is practically germ free,” the compartment door falls open, and Lenny and Squiggy stumble in to offer their signature “Hello!” Rather than their usual jackets, however, the boys are sporting attire that approximates that of a famous pair of detectives. Armed with the confidence that there’s no place like a train to find a mystery, Sherlock Squiggman and Dr. Seuss—you can probably work out who’s who—stand prepared to solve whatever enigmatic events might take place as they’re riding the rails. Unsurprisingly, it’s mere moments after Lenny and Squiggy have returned to their cabin that a mystery does indeed reveal itself, with a man walking into their cabin, struggling to speak, and only managing to get out a warning (“Beware the bald man!”), hand them a film canister, and instruct them to “trust no one” before falling forward to reveal a knife stuck squarely in his back. From there, the proceedings turn into the parody of Murder On The Orient Express that it was always destined to become, featuring a cavalcade of guest stars who’ll be instantly recognizable to anyone who grew up watching TV in the ’70s and ’80s, including Scatman Crothers (Chico And The Man), Conrad Janis (Mork & Mindy), Wilfrid Hyde-White (The Associates, Buck Rogers In The 25th Century), and—for no apparent reason other than to make the audience hoot and holler—Charlene Tilton (Dallas) pops up as a woman at the bar. But even while working within the confines of the mystery, the characters still make time for the occasional train-centric jokes, such as the drink spillage caused by the perpetual bumping. You can tell the show’s writers were having fun with the opportunity to skewer whatever tropes they could manage, as evidenced by the fact that one of the characters is actually named MacGuffin, but the cast of Laverne & Shirley made it very easy for them to do so. 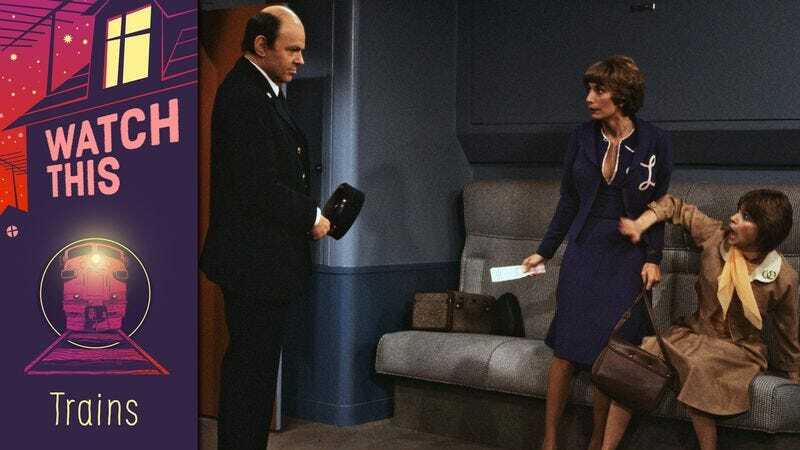 Not only did Penny Marshall and Cindy Williams work as well together as Michael McKean and David L. Lander did, but the foursome was able to take their comedic skills and adapt to whatever scenarios they were thrown into. Eight seasons on the air resulted in a number of such scenarios, some more ridiculous than the others, but “Murder On The Moosejaw Express” was an occasion when it worked wonderfully across the whole blessed two-parter. Laverne & Shirley is a classic example of what Garry Marshall brought to TV airwaves, with a chemistry-laden ensemble and comedy that, even in slapstick, honored the genres that came before it, while paving the way for sitcom years to come. Availability: “Murder On The Moosejaw Express” is available for streaming on Hulu, CBS All Access, and on DVD.